wanita.net Network ( http://wanita.net ), Home for Online Women, a leading women's media company and the number one women's community online in Malaysia. It is an online network that provides Asian related content for women that focus on issues and interests of importance to women. Over 1 million-page view and 65,000 unique visitors of wanita.net Network each month, the web site provides advertisers, direct marketers and merchants with targeted access to women using the World Wide Web. Our wide network of channels at wanita.net Network includes HONG REN GUAN wanita.net, wanita.net eShop & wanita.net Music/ iVote. 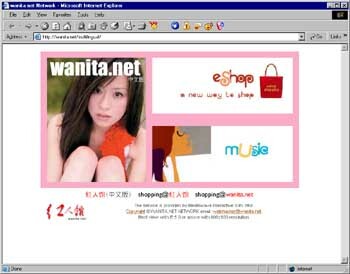 In the nine short years since its launch in 1998, wanita.net has become the leading Chinese online media in Malaysia. The channel is all about women in Asia with a unique blend of contents covering online polling, survey on lifestyles, fashion, beauty and food. wanita.net is also planning to introduce new contents such as career guidance, money matters, women¡¯s issues, parenting and health. wanita.net offers free membership services and benefits, including merchant discount, joining online & offline events organized by wanita.net and access to community forum, chatroom & interactive services. An important part of wanita.net is the proprietary Reading Room featuring leading women's magazines and celebrities¡¯ blog. This channel is positioned to capture a more matured audience base, Chinese women aged above 23 years old. 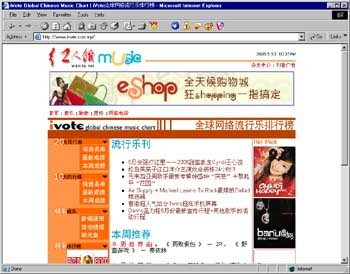 wanita.net Music/ I*VOTE Global Chinese Music Chart, is one of the leading online entertainment channel & music charts in Malaysia. It is an online entertainment channel covering news, information, exclusive interviews, online Chinese music voting, music reviews, movie reviews and interactive services related to Asian entertainment. This channel is positioned to capture a younger audience base aged between 15-25 years old. 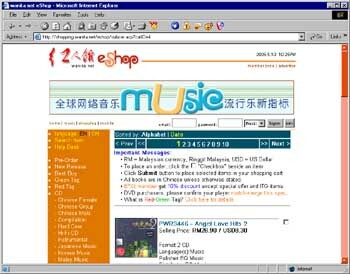 wanita.net eShop is the leading Internet source of Asian entertainment products in Malaysia. With an emphasis on quality service, user-friendly interface, culture-tailored content, fresh new release updates and broad product selection, wanita.net eShop is ranked high by its customers. We are continually growing and acquiring new users and retaining existing customers who choose wanita.net eShop as their preferred online retail store. We carry over 7,000 Original Chinese, Japanese and Korean products including music CDs and videos in both DVD and VCD formats. We have also broadened our product selection to include books and gift items.